How to cook cold soup? Kholodnik – a dish of Belarusian cuisine. It is a cold summer soup like Russian okroshka, but he has a significant difference. Friedge is prepared with beets, which gives it a nice rich color, and filled with yogurt. Rinse well under running water young beets with tops. Then cut the tops and peel the beets. Put in a saucepan beets, cover with water and put on the stove to boil. Ten minutes before ready, put in a saucepan tops. 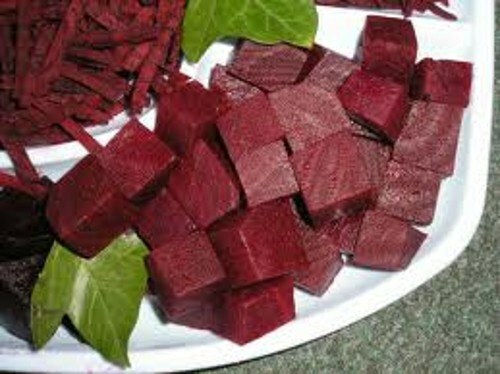 When beetroot is cooked, drain it along with the greens in a colander and let the water drain out. Beets with tops finely chop and place in a clean pot. Boil eggs, peel and cut into cubes. Fresh cucumber grate or cut into thin strips. Wash, dry and slice green onions. Put all in a pan to beets. Add the sour cream and sugar, stir and pour with kefir. Put in refrigerator to cool. Before serving, sprinkle with finely chopped parsley and dill. Wash and boil beets, then peel, grate on a coarse grater, place in a deep bowl and pour cold boiled water so that it covered the roots. Onion peel and chop as small as possible. Cucumbers, dill and green onion, wash and dry. Grate the cucumber on a grater, dill and green onions chop with a knife. Add all the beets and cover with yogurt. Add the sugar, salt and season kholodnyk a squeeze of lemon juice. Sour cream served separately. Wash and boil the beets and potatoes. Then peel and cut into small cubes. Boil eggs, peel and finely chop. Cucumbers and dill wash and dry. Grate the cucumbers on a coarse grater, dill and finely chop. Ham or smoked meat cut into thin strips. All the ingredients place in a deep bowl or pan, mix thoroughly, cover the bowl with a lid and refrigerate. Before serving, put the prepared ingredients of kholodnyk on plates, pour yogurt and chilled mineral water (ratio 1:1), salt and season with butter horseradish to taste. Vegetable dishes are recommended to prepare in a glass or enamel pot (if the enamel is not damaged). Friedge is traditionally eaten with sour cream and no bread. It replaces the baked or boiled potatoes, seasoned with butter, which is usually served to holodnyak cooked without potatoes.